If you’re out on the road as much as we are, you may find yourself on the side of the road from time to time. Even with regular maintenance, a well-oiled machine will still break down, which means that you may be stuck without a set of working wheels. That can be doubly problematic if you end up in adverse weather, or if you’re far away from our Denver auto shop. Here are a few items that you can, and should, keep close at hand in the trunk of your vehicle. That old owner’s manual may go unused over the years, yet it can be a lifesaver if you’re stuck on the side of the road and need to make a quick fix. 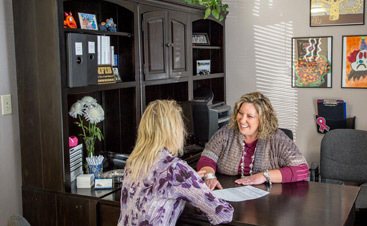 Your manual will have instructions for some basic repairs and maintenance guidelines. If you’re in a pickle, this is your first resource. Flat tires happen, even if you’ve got great tread. You could run over a screw. Or you could rupture your tire on a pothole. Regardless of how you end up with a flat, you should have all the tools you need to repair it. Make sure you have a full spare kit, including a spare (make sure it’s inflated! ), a jack to lift your car, a tire iron, and a lug wrench. You might also consider throwing in some WD-40 if those lugs won’t loosen up, and a tire sealant — which may prove to be the best solution. You can even invest in a mobile compressor if you can reseal your tire for the time being. When your battery dies, you’ll need a jump. And you can’t perform a jump without a set of jumper cables. You can also invest in a jumper battery (or jump starter) which will hold enough charge to get you started when your battery dies. Just be sure to keep your jump battery charged! This stuff is seriously invaluable. You never know when you’ll need duct tape, and you can use it in so many ways. Use duct tape to create a temporary cap when your radiator cap bursts off. Or use it to hold up your bumper if you get in a minor fender-bender. Just toss a roll in the trunk, you’ll use it. 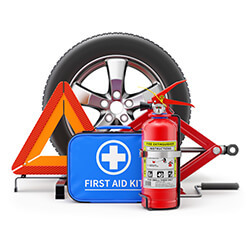 Keep an up-to-date first aid kit for any roadside emergencies. You could get in an accident that requires some immediate medical attention, or, you might just have a passenger who cuts his thumb on a can while you’re soaring over the highway. A first aid kit may prove convenient, and it might just be a lifesaver. Keep a thick blanket in your vehicle. In a blizzard, your blanket could save you and provide precious warmth. You can also invest in a mylar blanket which can collect rain water, provide much-needed shade, or warm you up, depending on where you find yourself. Keep some non-perishable food and a gallon of drinking water in your vehicle. If you find yourself completely stranded and without help, these two items will keep you alive. Plus, if you find that you’re just hungry or thirsty on a long road trip, you’ll have a backup. Like duct tape, a multi-tool can serve any number of purposes. Get a tool that has a pliers, a knife, screwdriver heads, and other tools — you never know when you’ll need an extra tool. While we’re often dependent on GPS navigation on our phones these days, you never know when you could find yourself lost, and God forbid, without a phone or cell service. Keep a roadmap in your car for such occasions. A comprehensive map of the country should be adequate if you’re lost anywhere in the U.S. You should be able to find a crossroads that you recognize, then you can pinpoint your location and head home. An extra set of clothing can provide comfort if you’re stuck in your car overnight, or it may be necessary to give you warmth if you’re stuck in a blizzard. Even a ratty old sweater, a pair of old jeans, and some socks could prove to be a godsend. 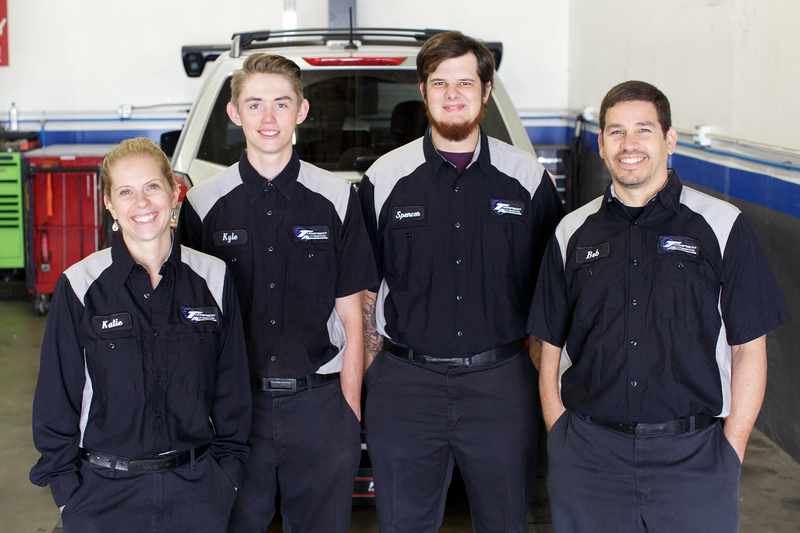 When you do find yourself with a broken-down vehicle, you can always bring it into our Denver auto shop. 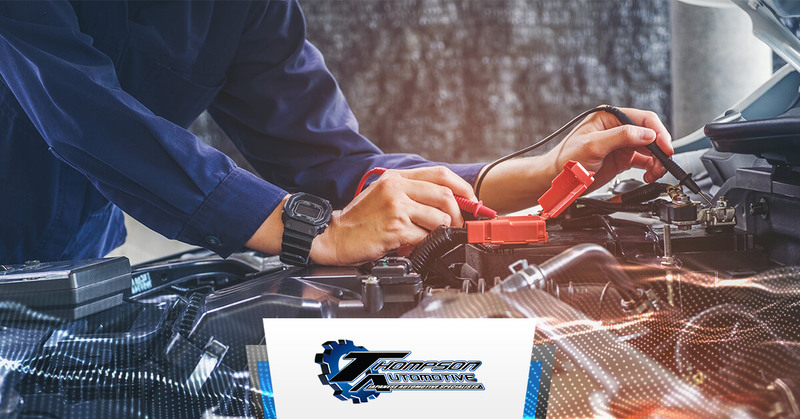 We’ll make sure your vehicle is fixed and road-ready in no time. 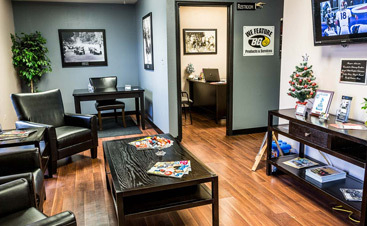 Reach out to us to schedule an appointment, or stop by our Englewood shop for service! Having Problems? Drop Us a Line! ©2018 Thompson Automotive. Do not copy. All rights reserved.